I recently decided to make a proof-of-concept for a simple hydraulics kit. 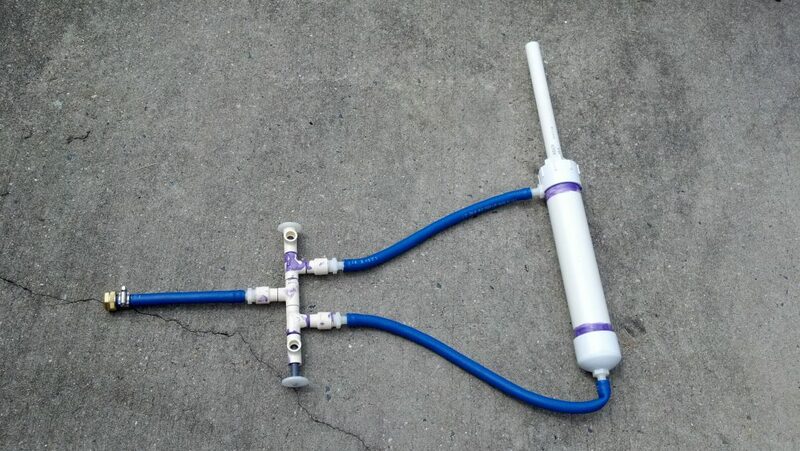 Ultimately you would be able to take this kit, get some standard PVC pipe from the local hardware store, and very quickly build your own simple hydraulic devices. Use it to learn about the principles of hydraulics while staying cool on a hot summer day, or use it to power your homemade tools like simple presses, lifts, or even an articulated digging arm. The pressure in your typical garden hose is nominally around 40 psi or so, so my first hydraulic cylinder should be able to develop about 125 pounds of force if it had really good seals. This is a proof of concept so I didn’t bother with o-rings or anything, so it leaks like crazy and thus is unable to develop quite those kinds of pressures, although it is quite strong. Moving from a 2″ to a 3″ hydraulic cylinder would bring this up to about 282 pounds of force, not too shabby for garden hose power! The hydraulic cylinder is made of standard PVC pipe (2″ for the cylinder and 1.5″ for the ram), although I had to use my lathe to turn down a 1.5″ pipe cap to fit inside the outer cylinder. The control valve is made of 1/2″ CPVC fittings and tubing, with the exception of the spool which is a length of 1/2″ solid PVC rod. I had to turn down the spool on my lathe to the appropriate profile and also had to drill out the valve to fit it. The fit is fairly poor but it shows that the concept definitely works. Eventually I am hoping to be able to have all the custom parts injection molded to get the unit cost down cheap enough that it would make a good toy for DIY doodlers and budding engineers everywhere. Dang, I’m gonna make a hydraulic elevator, and a tree house so that I have an elevated destination. The backhoe-style digger is actually one of the main projects I’d love to be able to build with this, though admittedly it would be a high-powered toy (but isn’t that the best kind of toy?). One of the easiest projects would be to outfit a hydraulic cylinder to a pair of loppers to make cutting thick branches easier. Turns out you can buy hydraulic loppers, chain saws, etc. A pair of hydraulic loppers will apparently set you back about $1400 though, not including the pump. Very cool project, thanks for sharing. Regarding sealing — I had the same problem making air cylinders for halloween projects, and solved it using CPVC plus O-rings — no lathe required. The photos at http://www.waters.to/blog/a-modula-all-pvc-pneumatic-actuator/ show a cylinder using #212 rings to mate between a 3/4″ CPVC piston and a 1″ coupling. You can also use a #208 ring to match between 1/2 pipe and a 3/4″ coupling. When I was working at Carls Jr, they used a water line powered trash compactor. The pressure varies depending on where you are at. At Fort Humboldt CA state park, it is 60psi. We use it to hydrostatic test the steam locomotives and steam donkeys. Capdiamont: That’s awesome, the trash compactor is one of the things I had in mind to try. I’ve heard of up to about 80 psi but it seems like 40 is a reasonable design point. Bill: Very nice! What do you do about lube? I made some PVC / O-ring-based water blasters a couple of years ago and they worked well, but it would refuse to even budge without grease. I’m trying to avoid risking giving people grease stains and having to re-lube / troubleshoot them, but yeah, O-rings are definitely the fallback. Thanks for sharing the project. As a hydraulics engineer who designs backhoe, I am very impressed. @ Bill Waters — those are some nice posts on your site. This is really cool. I have an old Southbend lathe that doesn’t hold tolerance very well; I’d love to find a good cylinder / piston match that could be bought off the shelf. Also, no need to use PVC for the piston. Just use some nickel plated rods from home depot. I’ve been working on something like this but I haven’t been able to find any easy to mate parts. Especially for the spool valve. I make one with foam seals on the spool and it worked but was really hard to move. I wish some company would injection mold a bunch of these parts for a run. I know someone who could do it, but the setup cost is way too high for just me to play around. As you know, hydraulic cylinders are expensive. I don’t know the intended purpose for your project but I feel that air it should prove more effective or even air/hydraulic affording more pressure to be obtain and consequently greater working force. Given your access to a lathe you could use a good quality metal tube and caps are easily bought or fabricated. Your proof of concept is excellent and that should be a natural development and probably you had that in mind all along. Let me know how you feel about it because I am designing a vertical turret for my lathe and feel encouraged by designs such as yours.I checked available commercial samples and also shop made units joining both with my own version adapted for convenience, versatility and ease of construction.